Lovers of classic cars or couples looking for a vintage feel to their wedding day may find just what they are looking for at the Automobile Driving Museum in El Segundo. 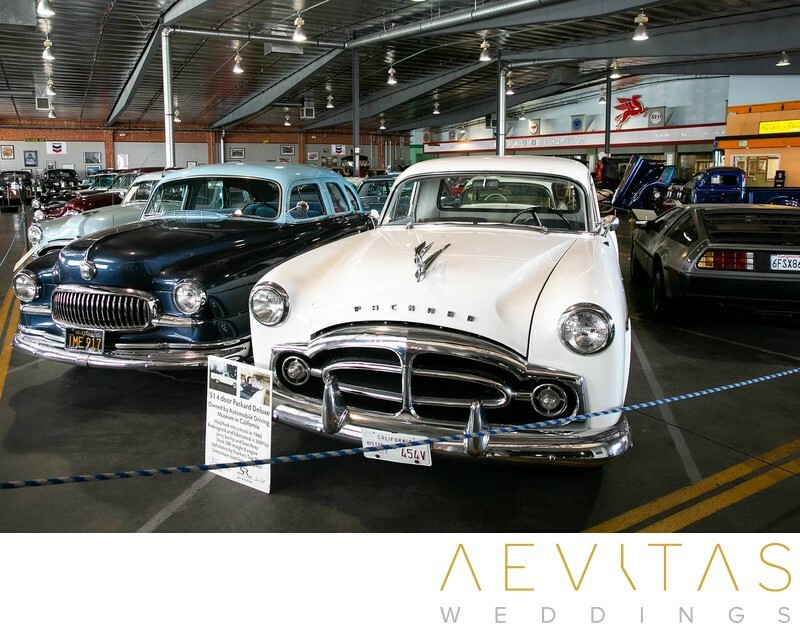 Dedicated to preserving Southern California’s automotive history and showcasing a range of beautifully maintained vehicles, the Automobile Driving Museum has opened its doors to create special and highly unique wedding events. When you decide to hold your wedding at the Automobile Driving Museum you have exclusive use of the venue, with the doors closed to the public and the staff at your disposal. Ceremonies are held within their spacious private ballroom which can hold 150+ guests and is like a blank canvas for couples to work with. There is flexibility to decorate the space just the way you want, adding in up lighting and florals to create a romantic ambiance as you say “I do”. While your guests are enjoying cocktail hour and exploring the impressive range of more than 130 classic, antique and vintage cars on display at the Automobile Driving Museum, the staff perform a “flip”, transforming the ceremony space into a lavish reception venue. There is plenty of room for a dance floor so you can party into the night and the creative potential to design the space exactly how you wish. You can select your own caterers and choice of beverages, with the Automobile Driving Museum more than happy to accommodate outside vendors, including live bands or cultural performances. But where the Automobile Driving Museum really shines as a wedding venue is in the choice of locations for couple portraits. The museum features cars from the ‘20s and ‘30s, former celebrity-owned vehicles, and Packard, Durant and Saxon models that are no longer produced. Not only can you and your loved one embrace in front of beautifully preserved vintage cars, but you can even get behind the wheel. “Back to the Future” fans will be awestruck that there is even a DeLorean time machine to step inside! A wedding at the Automobile Driving Museum gives you the opportunity to style a truly vintage-inspired day, and you might just be able to drive away in a classic car of your own!